I first met Kamala Willey in 1983, when she went to Varanasi (Benares), India with the University of Wisconsin's College Year in India Program, with which I was associated as Faculty Coordinator. During her academic year in Varanasi Kamala studied (and became quite good at) Hindi. She also wrote her field work project on Pandey Ghat—one of the many stone stairways leading down through the city street to the flowing Ganges river. 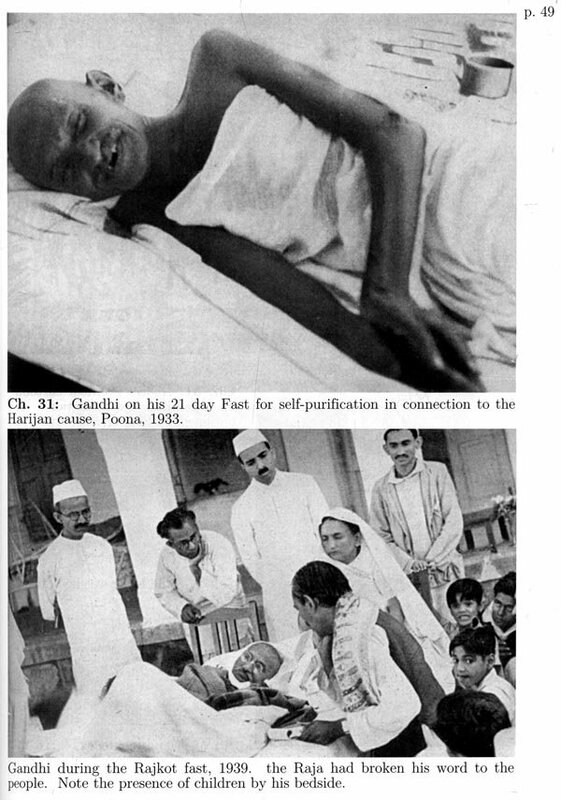 There was no choice but total immersion into the subject, by chronologically perusing the volumes page by page in order to glean the subtle processual and interrelationship connections that the environmental aspects of Gandhi's thought and life demanded. Looking for consistency was challenged by Gandhi who...adamantly insist[ed] on the right to revise his opinions or change them outright. 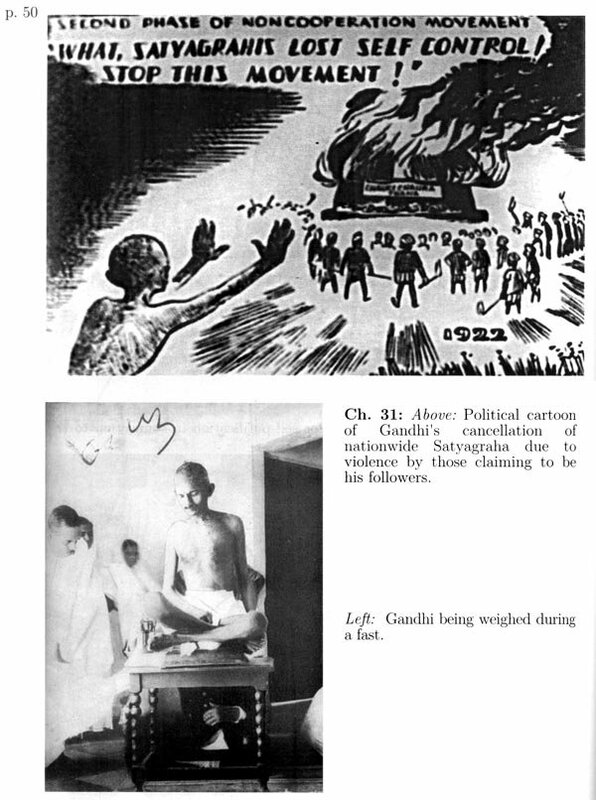 He saw himself as being helpless to go counter to his vision of truth, which was liable to change even beyond his own expectations...Gandhi wanted all his writings to be burnt along with him upon his death. He wished that people would say of him: "He fearlessly placed before us what he thought to be the truth at that time [Kamala's italics]." In its final form, Kamala's dissertation was an "explication of Gandhi's ecological education within the eco-communities and educational dimension of the constructive program." 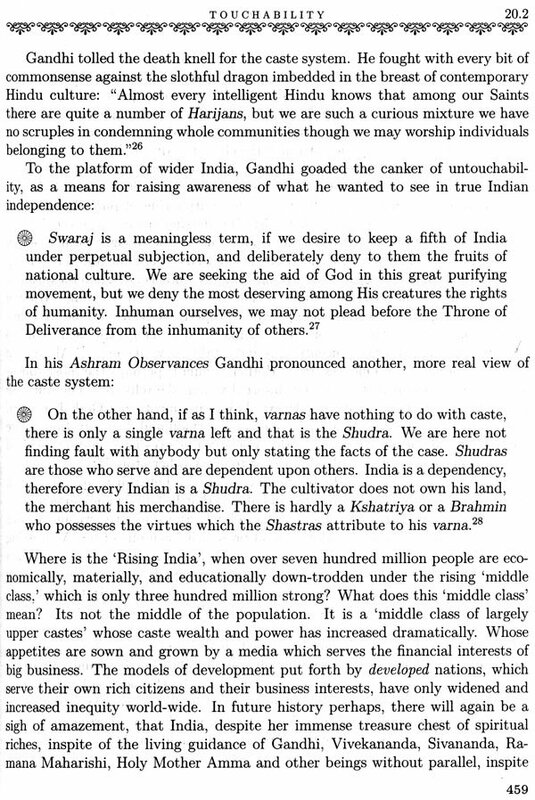 Kamala focussed on Gandhi's "eco-communities" or ashrams: Phoenix and Tolstoy ashrams in South Africa, and Satyagraha Ashram in Sabarmati and Wardha in India and finally Gandhi's ashram at Sevagram, a small village near Wardha. Kamala studied these ashrams' purposes, how they were established and maintained, and what their membership requirements were. She focussed on their constructive programs and especially on their eco-educational experiments involving spinning, Khadi (hand-spun and hand-woven cloth), diet, celibacy, fearlessness, abolition of untouchability, tolerance, equality, non-possession, trusteeship, bread labor, nonviolence, and Satyagraha (the application of truth-force for change). In 1991 in the United States, Kamala first met Mata Amritanandamayi (or "Amma," mother). Amma had been born in a small village near Kollam in the state of Kerala in the southwestern corner of India in 1953. At the age of five, Amma began composing devotional songs. As she grew older, she increasingly experienced moments of inner bliss in the presence of the Divine Mother. One day she heard a voice within her calling her to move beyond her inner bliss and to give solace to suffering humanity. Following her call, Amma's home became a pilgrimage place for people asking her advice and seeking her blessing--often in the form of a motherly hug. In time, Amma founded the Mata Amritanandamayi Mission Trust that started an orphanage, free medical dispensaries, a vocational-training center, a computer-training institute, and a hospice for terminally ill patients. In 1987, some of Amma's followers asked her to come to the West to meet people who could not come to India. 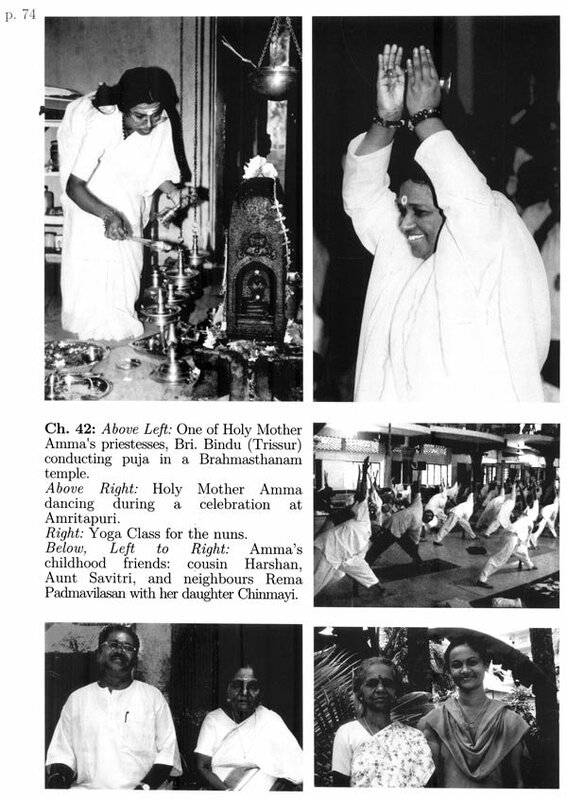 In 1989 Amma started the Mata Amritanandamayi Center in San Francisco for followers wishing to live in an ashram. Amma went on to found a university, an institute of medical science and research, hospitals and medical training centers, eye clinics and speech centers, homes for the aged and community aid centers, women's shelters and pensions for widows—supported by voluntary financial contributions. In the United States many of Amma's followers regularly prepared vegetarian meals for the poor. Amma had a world wide reputation as the "hugging saint." She hugged anyone who wished to be hugged. Many whom Amma hugged reported a deep sense of being loved. 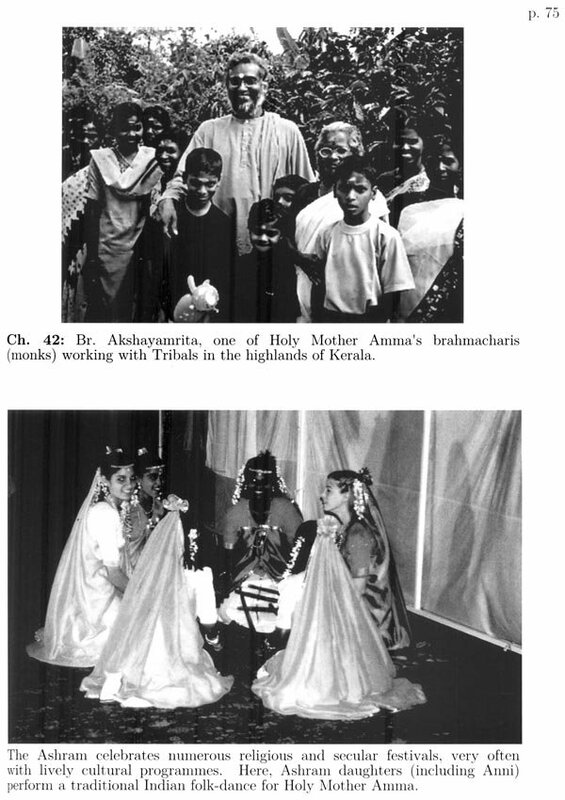 In 1993, Amma represented Hinduism in Chicago Parliament of World Religions. There were many reasons why Kamala was attracted to Amma. In Amma's presence, Kamala felt in touch with India's ancient heritage and relieved of the cynicism and materialism of the West. Kamala concluded that Amma's ashram in India provided the kind of spiritual setting where she could happily raise her children. Therefore, in 1999, she, her son Lincoln (age 12), and her daughter Annika (age 10) moved from the United States to begin their new life in Amritapuri, Kerala. 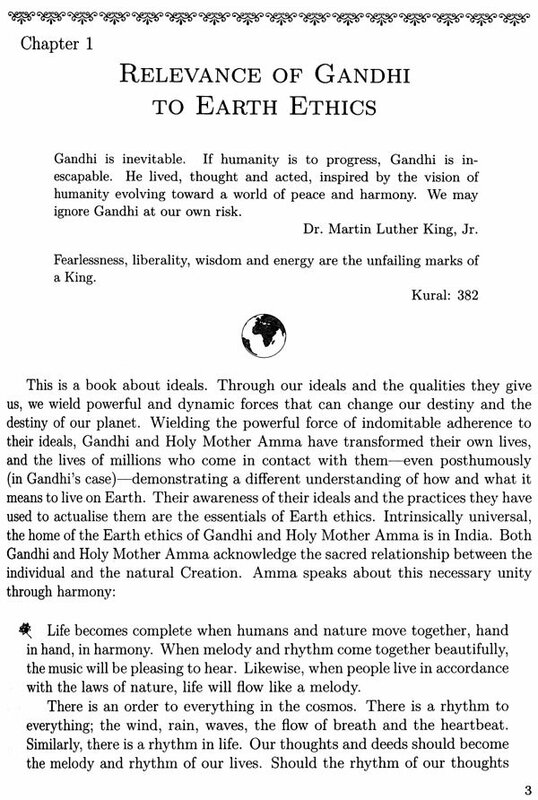 Even before Kamala moved to Amritapuri, Amma had suggested that Kamala, produce a book from her research on Gandhi's earth ethics. After Kamala arrived in Amritapuri, Kamala recognized that Amma's teachings and the eco-community life in Amma's ashrams both reproduced and enriched what she had learned while studying Gandhi's ecological education and earth ethics. So Kamala began to write this book. Kamala noted that Gandhi established his ashrams to engender rural community development in India. Amma established her ashrams in response to the "deluging oceanic love within her." Her ashrams existed for service to the world. As such they extended beyond Gandhi's ashrams. During the years Kamala was writing this book, Amma's mission raised mil-lions of dollars to relieve the victims of the 2004 tsunami that devastated parts of southeast and south Asia. In 2005 Amma's mission donated one-million dollars to the hurricane-Katrina victims in the United States. In 2006 Amma received the James Park Morton Interfaith award in New York. 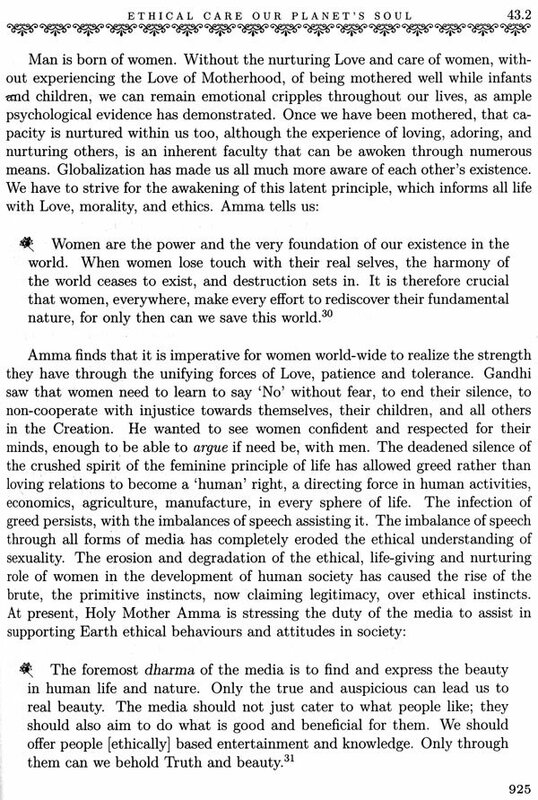 All of these reflected Amma's ashram activities extended beyond the ashram activities of Mahatma Gandhi. This book includes two unique components: (1) It contains an exhaustively-researched, carefully-aggregated, series of observations by Mahatma Gandhi regarding ecological education within eco-communities (ashrams) and educational dimensions of his constructive program. For Gandhi, a major purpose of his ashrams was to develop a model community that could be replicated and adapted throughout the world. 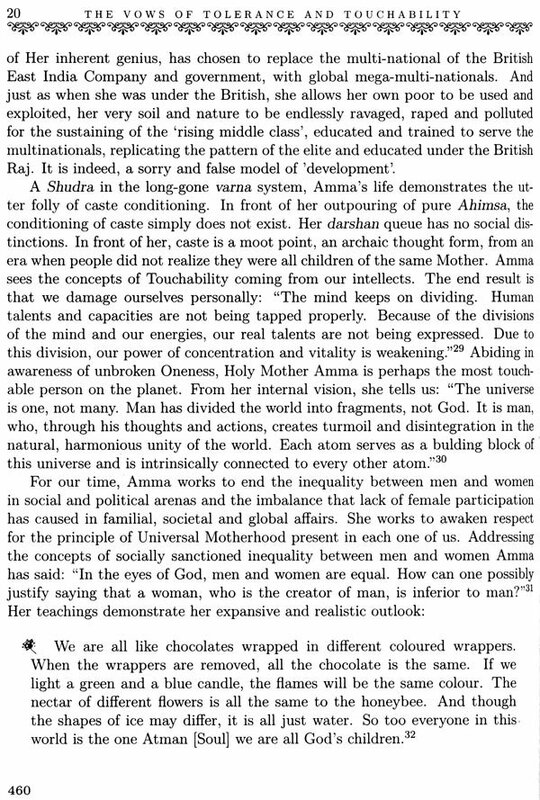 (2) It contains observations from Amma drawing on her own experiences with her ashrams. For Amma, a major purpose of her ashrams was to provide golden opportunities for participants to concentrate on the ethical life. To the extent Amma's observations repeat those of Gandhi, Kamala points out the remarkable parallels reflecting the fact that both of them draw upon India's ancient heritages. 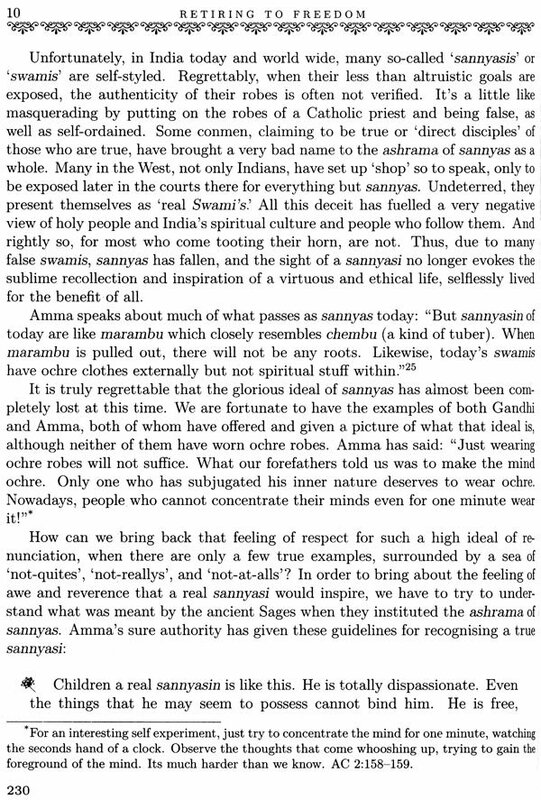 To the extent Amma's observations go beyond those of Gandhi, Kamala suggests that this may be through Amma's greater sensitivity to the role of Mother, her application of that sensitivity to her ashrams, and her awareness of the heritage of the Divine Mother. Those everywhere in the world interested in enhancing women's roles will find these observations particularly valuable. India, Gandhi, and Amma have provided unique contributions to worldwide earth ethics. Their contributions are well worth reading—and contemplating. We are indebted to Kamala for having made them available. In this process, the spirit and voice of India, through M.K. Gandhi, and Holy Mother Amma have eternal veracities to teach and tell us. We are evolving to an awareness of our shared life which will ultimately bring about consensus on what the ideals of our ethics and morals are, what we all know and hold to be the Truth. This Truth will include the whole of the Creation here with us. Gaining an understanding of India's contribution to this philosophical accord of ideals is essential for the establishment of a global consensus on ethics in practical terms. Mohandas Karamchand Gandhi lived from 1869-1948, yet today there is greater interest world-wide than ever before in his teachings and thinking. His ethical awareness was unconsciously born in India and initially honed in South Africa. Through his ideals he was to develop new economic patterns for social action in India, working through communities and environmental upliftment. He was not alone in his efforts, nor were his ideas new. He took his inspiration wherever he found it. 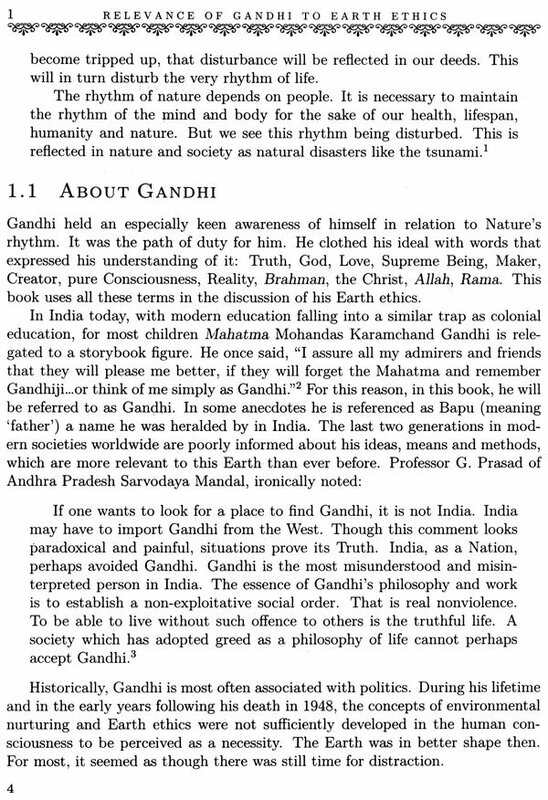 Yet Gandhi pierced through to the ethical core of each ideal, and presented that to himself, his communities, and to the nations, by the means he employed to actualise them. Gandhi's effort towards realizing his ideals, towards actualising his Love, has touched millions, regardless of culture, clime and time. In a world abounding with false prophets, teachers and self-acclaimed healers, with the blind leading the blind, he stands as a beacon of hope for many as to the innate sanctity of the human heart, knowable through sincere integrity and effort. Somehow we regard him with reverence and awe; for he demanded of himself and went within that Self where we all know we ought to go, but haven't yet mustered up the gumption to go to, for whatever reason. In her youth, Amma was surrounded by the natural tropical splendour of coastal Kerala. It was an atmosphere that was largely politically untouched, with traditional rural life, steeped in India's glorious spiritual heritage. She has often spoken of the deep kinship and caring that the villagers had collectively towards one another in her youth. High standards existed despite the lack of material opulence. As a woman, who was bearing and self-identified with a consciousness that cannot be shackled to gender-bound, social or cultural and caste-minded conditioning, Amma has risen and continues to rise above tremendous obstacles to hold the Truth of our being aloft before us, inviting us all to join her in an opening and out-pouring of our hearts in Love for the Creator and Creation, as being one another, the great consciousness of which we are all a part. Hers is the way of unconditional, merciful Love. In the Holy Mother we see the living biblical precept: "Love the Lord thy God, with all thy heart, with all thy mind, with all thy strength, and thy neighbour as thyself." Both Mahatma Gandhi and Reverend Martin Luther King dreamt of a world in which human beings are recognised and loved as human beings, without prejudice of any kind. Remembering them, Amma also places a vision of the future before you. Amma too, has a dream. It is a vision of a world in which women and men progress together, a world in which all men respect the fact that, like the two wings of a bird, women and men are of equal value. For without the two in perfect balance, humanity cannot progress. Dr. King was courageous like a lion, yet in his heart he was as soft as a flower. He risked his life for the sake of Love, equality and the other noble ideals he upheld. He had to struggle with great perseverance against the people of his own country. And Mahatma Gandhi didn't just preach. He put his words into action. He dedicated his whole life to peace and nonviolence. Even though he could have been the prime minister or president of India, Gandhi declined because he had no desire whatsoever for fame or power. In fact, at the stroke of midnight, when India was declared independent, Gandhi was found consoling the victims of a riot-affected area. 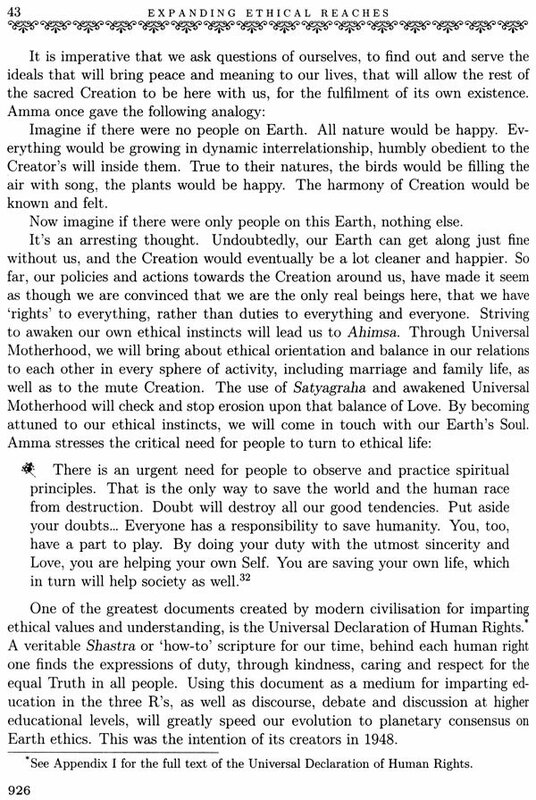 Both Gandhi and Holy Mother Amma were and are dedicated to the actualisation of ethical ideals on personal and societal levels. Both are national leaders and global figures, whose inspiration alone has generated numerous other social and environmental uplift projects. In Gandhi's time, these works were known as the Constructive Programme. Holy Mother Amma has established the Mata Amritanandamayi Mission Trust (1981) and the Mata Amritanandamayi Math (1984), which work in numerous avenues for social uplift and betterment, not unlike the widespread umbrella of the Constructive Programme. These works include: widow and disabled people's pension programs, homes for the homeless, cancer and AIDS hospices, job creation, addressing farmer's issues, tribal outreach and uplift, legal aid cells for the poor, soup kitchens, youth fellowships, schools, scholarships, hospitals, medical camps, disaster relief, a stream of projects and services too numerous to include here. The paths for social welfare are mush-rooming fast as her simple message of Love and service to all inflames willing hearts across the planet. Much of the humanitarian and charitable efforts that Amma is making are at a very basic level food, shelter, clean water, clothes, medical attention, a chance at education, job training, etc. The scope of these works alone is too vast to see clearly, but it is evident that ceaseless service to all is the intention behind them. The wonderful aspect of her work at present is that it is under her living inspiration, and exists for all to participate in now, or to take inspiration from to start their own.